About Hotel: 4-Floors, 79-Rooms, Interior Corridors, Flat panel LCD TV with HBO and 100 cable stations, Coffee and tea maker, Cribs, Free high-speed Internet access, Microwave, Refrigerator, Voice-mail, Business Center, Free Breakfast, Laundry, Fitness Center, Heated indoor pool, Wake-up service, 100% non-smoking facility, Whirlpool. Railroad View: Excellent View. Some trees foul the direct view from some rooms in the center of the building. Ask for an upper floor on the rear of the building, south end of the building is the best, or north end rooms 402,404,406 I found to have a clear view of the railroad as well. Windows do not open. Sound is not an issue for light sleepers. Viewing trains at night is fine, I was even able to view locomotive numbers, however its too dark to video passing trains at night. Railroads past Hotel: CSX / W&LE. Expect about 40-train during a 24-hour period. During my 12 hour stay I logged 13 trains, I missed a bunch for sure, and I did sleep pretty well. I didn't notice any W&LE trains during my visit. Comments: During my 2014 visit, I really enjoyed this hotel, clean and kept in perfect condition, breakfast was wonderful as well. 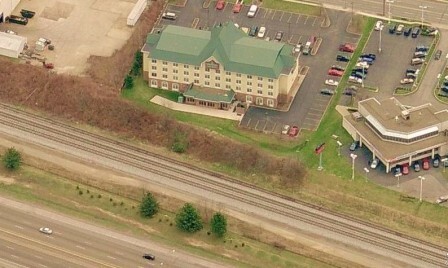 Photo Comments: Aerial view shows the rear of the Country Inn & Suites. During cooler months the view should be improved when the trees are bare. During foliage, the trees are a bit taller then they look here, and the brush is thick. Night Photo: The night time view from room # 404, I had a clear view of the passing trains. This timed exposure lightened up the scene a bit, I had some trouble reading locomotive numbers at night. Route 8 is the lit-up road way seen in the photo. The new LED street lights cut down on "light noise", meaning it lights up the roadway but nothing else. Second to bottom: Looking south down the rail line from room # 404, an auto-rack train snakes its way around the line. Rooms on the south end of the hotel maybe better to achieve this photo angle. Room 404 is on the north end of the building. Bottom Photo: The View from Room # 404, A northbound CSX freight is seen out the window. Rooms 402,404,406 are the best rooms on the north end of the building, there are not any high trees in the way. Floor Plan: Here is the floor plan for the 4th floor. This is the best floor for train-watching. I found rooms 402,404,406 to offer an excellent view of the railroad. Rooms in the center of the building have large trees directly outside the window (along the tracks), Rooms 420,422 may also have a perfect view but I was unable to check the view from those rooms during my visit. I imagine lower floor rooms are situated with the same floor plan, just substitute the first digit with the floor number. 3rd floor rooms maybe OK, but I'm sure 2nd floor rooms will not have much of a railroad view.